A few times a year, our senior leadership team members step out of their consulting roles to give keynote speeches, facilitate seminars, and present at conferences. Drawing from our broad consulting work and ongoing research, we address the exciting opportunities facing companies today and provide an up-to-date perspective on the key marketing topics of our times. Dr. Erich Joachimsthaler is a rare combination of consultant, author, entrepreneur, academic, and researcher who sheds light on massive branding, marketing, and digital transformations. 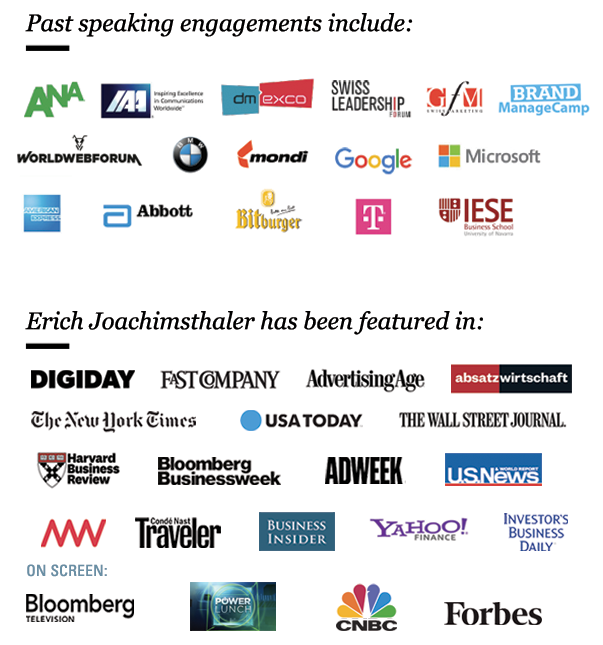 An award-winning author of several books and over 100 articles, Dr. Erich Joachimsthaler is a strategy, innovation and branding expert, “one of the most sought-after keynote speakers on the topic of marketing,” the CEO of Vivaldi, and a visiting professor and lecturer at prestigious universities around the world. 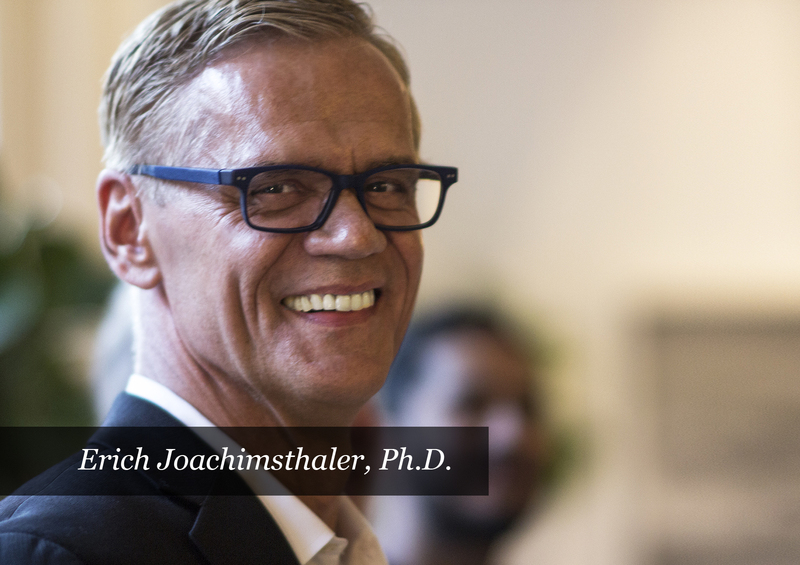 Dr. Joachimsthaler's particular focus is on developing new marketing strategies applied to industries facing disruptive transformation from rapidly changing customer expectations. He has worked with hundreds of companies to build strong brands, identify innovation and growth opportunities, and fully realize them in today’s digital age. As one of the most sought-after keynote speakers for industry conferences and company meetings in Europe, Asia, and the U.S, Dr. Joachimsthaler's powerful, inspiring, and highly engaging style has earned him invitations to speak at major events like the Forrester Consumer Marketing Conference NYC by Google in 2017; TEDx at London Business School; IAA Leadership Conferences in Ghana, Cannes, Moscow and London; Brand Week Istanbul 2016; Philippines Global Marketing Conference; the Swiss Leadership Forum 2016; and ISBM Big Thinker Conference 2017. Dr. Joachimsthaler conducts his conferences, speeches, and workshops in English, German, and Spanish. Brilliant mind… excellent presentation… among the absolute best in the business. An internationally-recognized authority on the impact of technology on strategy, the digitalization of industries and categories, and the role of innovation and branding, his words are often referenced in USA Today, The New York Times, The Wall Street Journal, Investor Business Daily, Advertising Age, Absatzwirtschaft, Brandweek, Bloomberg Business Week, Marketing Week, Fast Company, US News & World Report, Forbes, a host of trade publications, and extensively in European and Latin American media. On screen, he has been featured on Bloomberg Business TV, CNBC PowerLunch, CNBC Europe, and ForbesTV.com. Dr. Joachimsthaler has received many awards and distinctions for his work, writing, and research. Most recently, Dr. Joachimsthaler was named a Top 50 CDO Influencer in a 2017 ranking of global superstars from the fields of digital transformation and the adoption of data-driven culture. Late this year he will be inducted as an ISBM Fellow, which recognizes Dr. Joachimsthaler as a senior scholar/ thought leader, having made significant contributions to the advancement of the theory and practice of B2B marketing. Only 27 academics and scholars worldwide have been awarded this distinction. Powerful Speech at TEDxLondonBusinessSchool: "Love is Not Enough!"